In this week’s Martin & Sylvia story “Apple Pies”, Mr. and Mrs. Brown, the farmers who live next door, are hosting an apple pie contest, complete with games, stories and a lot of apple pie eating. All families must bring a pie to be judged. We’ve already talked about Martin’s amazing bacon apple pie, but I think Sylvia’s idea sounds good, too! She makes a “crust sandwich” with jam and then stacks in apples, honey, and cinnamon. Sounds warm and delicious, right? Sylvia’s idea got me thinking—why not skip the pie and make crust-less apple sandwiches? The apple “sandwich” stackers that follow are the result. While I’ve chosen to stick close to Sylvia’s original ingredients—subbing only peanut butter for the jam—feel free to get creative with these. Think yogurt, cheddar cheese, or any flavor of nut butter you have on hand. Try different kinds of nuts and grains for the crunchy parts, depending on what you like. And if you aren’t afraid of a little mess, lay out the ingredients and let the kiddos stack them together! In a small bowl, mix the oats and cinnamon. Add the honey and oil, and stir until the oats are coated. Spread the oat mixture on a baking sheet and toast in the oven for 10-15 minutes, stirring occasionally. Your nose will know when they’re done. Once the oats are done, prepare your stacks. 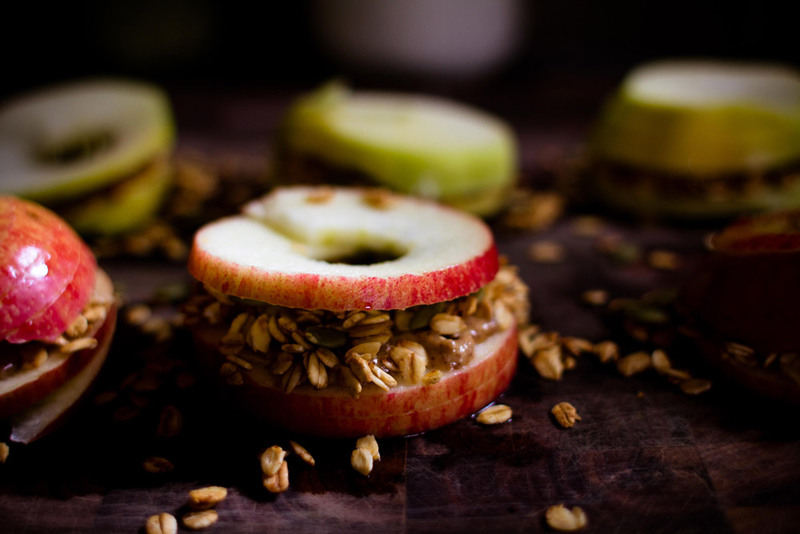 Start with the bottom apple slice, then layer on some peanut butter. 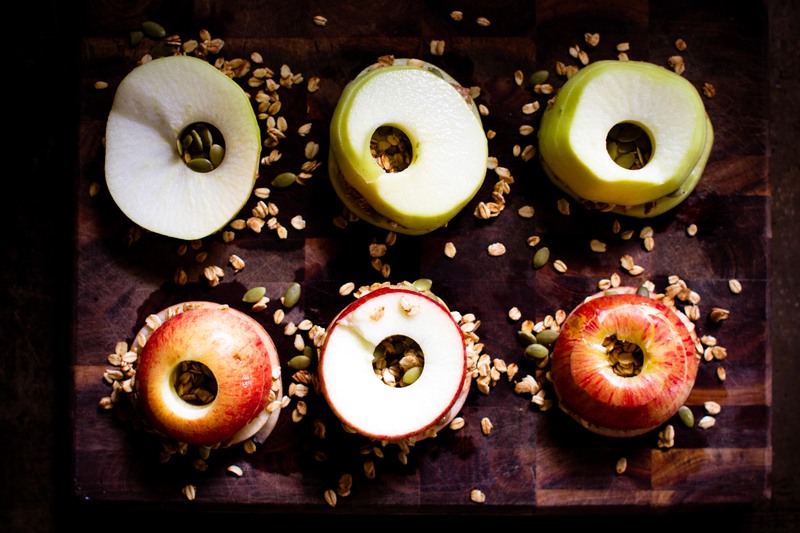 Sprinkle on toasted oats and pumpkin seeds, then top with another apple slice. Enjoy for a snack or light lunch! The Sparkle Kitchen Series is created by Meryl Carver-Allmond. Meryl lives in a hundred year old house near the prairie with her sweet husband, two pre-schoolers, one puppy, one gecko, and about ten chickens. While she's been writing since she could pick up a pen, in recent years she's discovered the joy of photography, too. She feels lucky to be able to combine those skills, along with a third passion--showing people that cooking for themselves can be healthy and fun--in her weekly Sparkle Kitchen posts. When Meryl isn't writing for Sparkle Kitchen, you can find her on her personal blog, My Bit of Earth, where she writes about chickens, babies, knitting, gardening, food, photography, and whatever else tickles her fancy on any given day. Martin and Sylvia live in tall house with lots of windows. In their backyard is all a five and a seven year old could ever want: a brook, a tree swing, a playhouse and a garden full of magical friends. Join this enterprising brother and sister for a year of delight and wonder. Whether it's the heat of summer, or the deep snows of winter, every day is an adventure!